According to the most recent 2017 numbers, there are an estimated 3.7 billion (yes, with a B) Internet users. Yeah…that’s a lot. And I think we can agree it’s a safe bet that not all of them speak the native language of your site. So if you’d like to make your WordPress site more accessible to those billions of people, one of the easiest ways you can do that is with a Google Translate button. Google Translate is by no means the be-all-end-all solution for creating a multilingual WordPress site. But it is one of the quickest and easiest ways to make your site accessible to people who speak different languages. In this post, I’ll start with a quick rundown of when you should choose Google Translate over something more static like WPML. Then, I’ll show you how to add a free Google Translate button to both Divi sites and other WordPress sites. 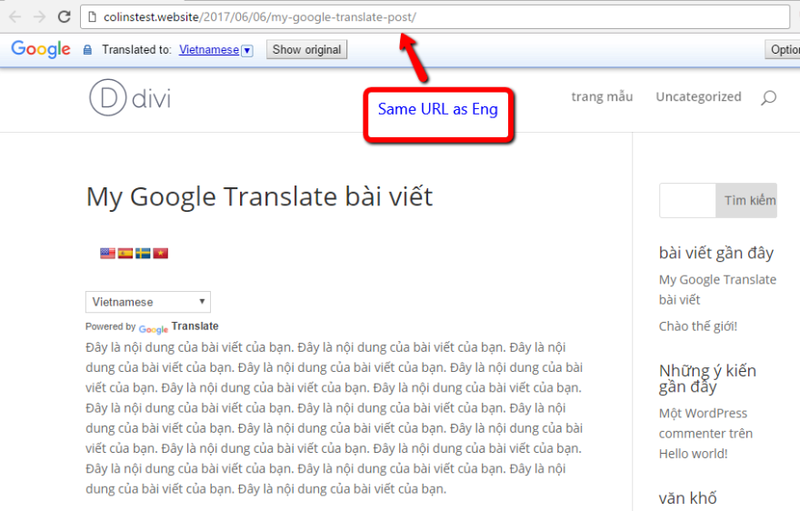 When Is It a Good Idea to Use Google Translate for WordPress Sites? We’ve already featured a guide on how to create a multilingual website with WPML, which might leave you wondering how this Google Translate button is any different. Basically, WPML gives you the functionality to create fully standalone translated versions of your site that search engines like Google can index. WPML won’t do the actual “translating” for you – it just gives you the ability to create a cohesive, SEO-friendly translated site. If you’re serious about creating a usable, rankable version of your site in a different language, it’s 100% better to use a dedicated tool like WPML. It just takes a lot more time and effort. Google Translate, on the other hand, dynamically translates any page on your site into any language supported by Google Translate. You don’t need to handle translations yourself. Users can select from more than 90 languages, which would be nigh-on impossible to offer with something manual like WPML. You don’t need to store translated versions of your site. Google won’t be able to index the translated versions of your site. This is a huge negative if you’re trying to go multilingual for business purposes. It’s exclusively machine translation, which is by no means perfect. You can’t go back and manually edit any of the machine translations to correct errors. If you just want to make your content more accessible and don’t care about SEO, cohesive experiences, or business uses, Google Translate is a good option. Otherwise, stick with something more static like WPML. 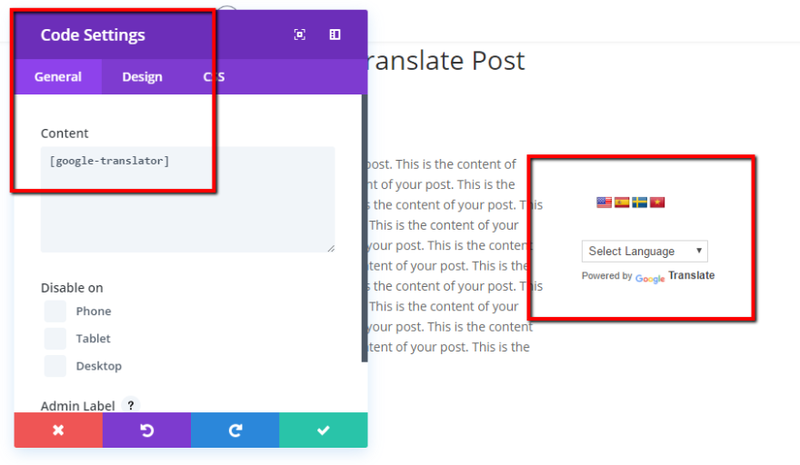 To add Google Translate functionality to your WordPress site, you can use a free plugin named Google Language Translator. Popular. Over 100,000 active installs according to WordPress.org. Updated. The last update was 2 months ago and the changelog is full of minor bug fixes and enhancements. Flexible. It gives you a good deal of control over languages and locations for your translate button. Well-reviewed. 4.5-stars on over 120 ratings at WordPress.org. Here’s exactly how to use the plugin for regular WordPress installs, as well as Divi sites. 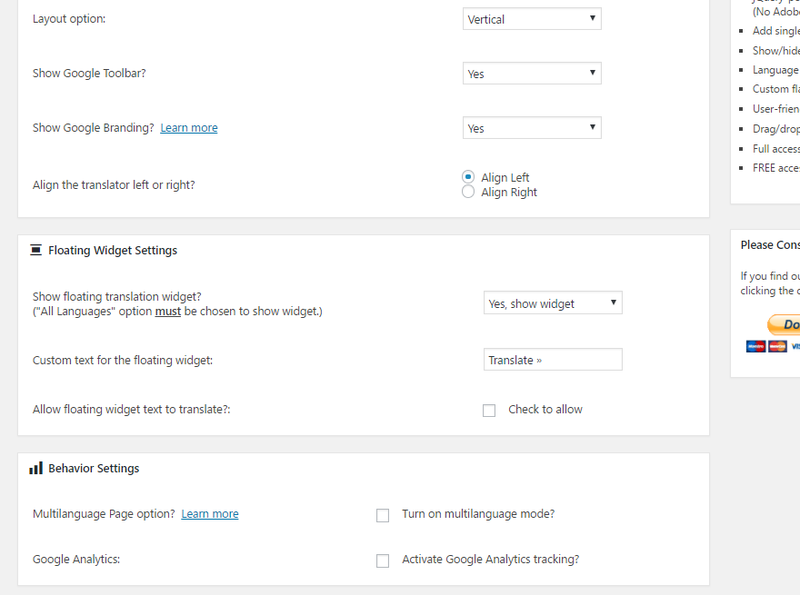 To get started, you can install and activate Google Language Translator right from your WordPress dashboard. Once you’ve got it activated, you can configure the plugin by going to Settings → Google Language Translator. The settings are well-documented, so I don’t think you’ll need too much help to get things set up. But here are some of the highlights of what you’ll definitely need to select. First, under Main Settings, make sure to select the original language of your website in the Choose the original language of your website drop down. For example, if you write your content in English…you should choose English. Not too complicated! In Layout Settings, you can choose whether or not to show flag images and, if enabled, which specific flag images to display. Note – users can still select any language from the drop down. This setting just affects the quick link flags that are displayed above the language drop down. Then, at the bottom, you’ll see a Usage section which gives you a shortcode and PHP function to display your Google Translate tool. Beyond these options, the plugin also gives you a dedicated widget that you can use in any widgetized area on your site. Make sure to click Save Changes, and then you’re ready to move on to displaying the Google Translate tool. If you want to make the Google Translate tool available on every page of your website, the easiest way to do that is to use the built-in widget. Of course, you could also use the included PHP function if you feel comfortable digging into some code. If you’d only like to display the Google Translate option for specific posts or pages, you’re probably better off using the shortcode. Note – don’t try to use a shortcode AND the widget at the same time – it won’t work. You need to pick one or the other. The shortcode works whether you’re using the normal WordPress Editor or the Divi Builder. But I’ll show you both to be thorough. What Does It Look Like When Someone Uses The Translate Tool? 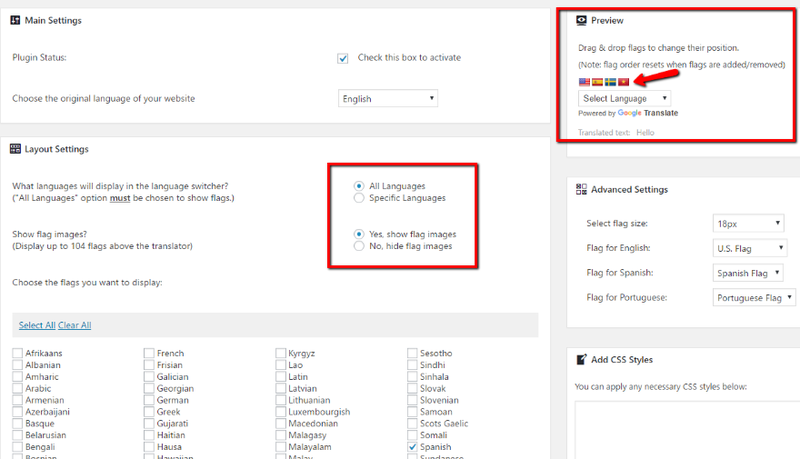 All in all, you can be up and running with Google Translate on your WordPress site in just a couple of minutes. The only downside is that you can’t manually edit your translations, nor will Google be able to index the translated versions of your site. If you’d like a plugin that lets you create a multilingual site quickly while still allowing you some flexibility, you might also want to check out Weglot. It offers a happy middle ground between Google Translate and plugins like WPML. Now over to you – what are your thoughts on Google Translate vs the more heavy-duty multilingual plugins? Which do you prefer and why? Excellent contribution, is an interesting option. What would you recommend for different English translations? For example, if a page says color, if Canadian or English UK is selected, it’ll make it colour. Also, does this affect styles or css? Thanks for the tutorial, using the WP plugin and adding the code is new. Can you guys shows to add related post or popular post in sidebar or in post content without using any WP plugins. The Extra Theme looks good, can we have that for Divi ? Hi! But almost all browsers have applications that automatically translate foreign websites. Why strain your WordPress? I was thinking the same thing. Even mobile browsers have a built-in translation feature (at least Chrome does). How to add The Google Translate Shortcode on Menu Bar? Just a note of caution, Google Translate is far from accurate. While it can translate words, it misses nuances and cultural components that can be critical when communicating with a foreign audience. It’s an easy trap that can have long-term, negative impacts. For a plain info site it’s fine. Better some translation than nothing at all. Thanks you for the clear explanation! Thanks again for an excellent article on a useful plugin. I’m based in Australia, where over a quarter of the population was born overseas, and a further one fifth have at least one overseas-born parent. The ability to add translation to a webpage is obvious. What is less obvious are the times our content may not be well translated. My main website is on the subject of double glazing. As with any technical field, I’m guessing that there will be a lot of terms used in the double glazing industry that will not be translated well. Writing content that would translate well means writing in simple english, using a minimum of technical terms and buzzwords. In the same vein, I for one, would need to be careful about using he vernacular in pages I want to translate. I like to ‘speak’ to my visitors using words and expressions they identify with. However, if I’m writing for a young audience, and describe something as ‘sick’, it’s probably not going to translate well. If I describe something as ‘fair dinkum’ (true, honest) that’s probably not going to translate at all. Bottom line? A feature like Google Translate is just another tool. So is a hammer. Whether I hit a nail, or my thumb, is up to me! Google translates for websites??? C’mon, guys.